The Dorset School Games - a parent’s perspective! 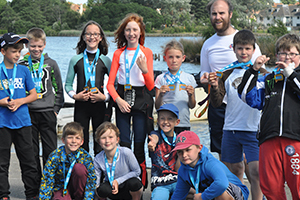 A few days ago I wrote an article about the Can Do festival at Poole Park Lake, organised and hosted by Rockley Watersports. On Thursday I was at the Dorset School Games for Primary school pupils in a work capacity but I am writing this piece through the eyes of a parent! 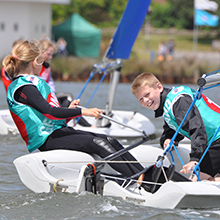 The Dorset School Games is a sailing event set up in conjunction with Active Dorset for Primary and Secondary school pupils (held on different days) with at least an RYA stage 2 sailing certificate. Each day comprises a series of races in the morning with an afternoon of sailing regatta based on the morning's races. For the first time, Longfleet Primary School chose to enter a group of 12 pupils, one of whom was my nine year old daughter, Daisy. Having just gained her RYA Stage 2 at Easter, and having a very competitive edge (hands up, that’s my fault, however I believe not a bad trait to have!) she was super keen to be part of the team. I was just glad that her love for sailing is growing each time she has the opportunity to get in to a dinghy. Those who I work with are exasperated by the fact that in my twenty years of working for Rockley, I have shown very little interest (OK none) in sailing. I have instead chosen to live this sport through my child! The day involved over 90 children from various local schools and it was lovely to see so many children and adults taking advantage of this great FREE event. There was a slightly edgier feel to this event – certainly more competitive children (accompanied by equally competitive parents) and definitely more competitive teachers! I get the feeling that the world of racing breeds this kind of spirit! There were schools with children who were very good sailors – many have done it as part of their school curriculum as well as those children who are members of local yacht clubs. Basically, racing is part of their life and these schools were spoilt for choice in terms of which pupils were going to attend the event (the best ones were selected of course!). Then there were schools like Longfleet who didn’t have the luxury of hand selecting seasoned racers but instead managed to grapple together a group of children who had sailed before at some point but were all very keen and excited at the prospect of spending a day out of the classroom! You could have considered them the underdog – but we all know that everyone loves an underdog! Many of the Longfleet children were nervous before their races but they were paired with this in mind and it was very much a ‘try your best’ and ‘we’re here to have fun’ kind of pep talk form teachers Mrs Eden and Mr Thurlow. It was also important that all the children had a go at helming and crewing giving them an all-round experience. For Daisy alot of the nerves bore out of wanting to do well – I think competition in all individuals no matter what age is a natural and healthy thing to have and it’s what spurs us on in sport and life. It also didn’t help that the wind was pretty strong (after 2 previous days of light winds) and they were presented with the unfamiliarity of being in a race situation – I mean it takes years of practice to be able to master the art of successfully starting a dinghy race! The 12-strong team were great at supporting each other and spurring each other on, and the teachers approached the day in the way that it was intended when the initiative was set up – to give kids the opportunity to come together and compete as a team in a non-school environment. Which parenting tack to take! One race followed another and I was very proud of Daisy and all her friends as they came in after a race, elated and achieving very acceptable race positions. As we approached the afternoon races, Longfleet managed to secure places in all of the three finals! For Daisy and her partner Kieran in year 5 it was a mixed morning. Their first race started off amazingly well with them approaching the line challenging for second position but like many things in life, things don’t always quite go according to plan and the shift in wind meant that they came in a respectable fifth place. Accusations of sabotage (due to the wind change resulting in them accidentally hitting another dinghy - I told you it was competitive) left her feeling a little deflated and lacking in confidence for the final race. So which tack to take as a parent was my dilemma? Phrases such as ‘it’s all a bit of fun’, ‘you’ll love it when you’re out there' were followed by ‘you’ll regret it if you don’t go out’, ‘you don’t want to let Kieran or your team down’ (OK I was getting desperate by this point). In the end, knowing that my absence would probably be the best option, I told her I had to head back to the office, hid behind a tent and hoped for the best! To my delight, I watched her start the race and when she came in she was absolutely buzzing having capsized yet still managing to secure third place. They both wore the biggest smiles and yes, once again very proud! At the end of all the events, the children were excitedly talking about all their races. Both teachers were quick to point out how absolutely amazingly they had behaved and how well they had worked as a team. During their day out, each child had managed to achieve whole-heartedly and uncompromisingly the school values – be kind, be aspirational, be resilient. As a parent, I along with so many others feel that it is really important that pupils have the opportunity to take part in sporting events or visits as part of their school life. Youngsters discover and learn so much about themselves, develop so many life skills and experience such a sense of camaraderie. I feel lucky that both my children are attending a school which supports this as part of their learning and embraces these opportunities. I know that Daisy was looking forward to her whole week at school partly because this was how she was going to spend her Thursday. 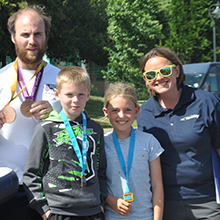 At the end of the day, medals were being presented by 5 x World Champion, double Paralympian (Bronze medal in London and Rio) and local boy Niki Burrill who was fantastic at talking to the children about his achievements and allowing them to wear his medals. A true inspiration for all the children in whatever they choose to do with their lives. Longfleet as it happened managed to bag a fab six individual medals (a combination of bronze and silver) and the underdogs did prevail with a fantastic bronze in the overall school standings. The Longfleet team were absolutely over the moon, barely believing it was true – lots of high-fives and whooping ensued followed by the obligatory photo with Niki where they got to show off their individual and team medals. The smile on Daisy’s face lasted for the rest of the day, even at dinner time where she barely had the energy to lift her fork! She had a truly fantastic and memorable day. 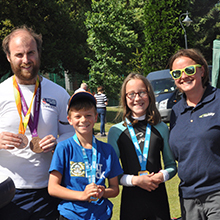 She’d made friends with new children, she experienced a range of emotions – nerves and disappointment followed by success and pride, she got to take part in a real – life dinghy race situation and got to be part of a great team. Her confidence now has really soared and she can’t wait to get back on the water. A huge thank you to Rockley Watersports who put this event on for FREE. The amount of organisation involved to run an event of this size is ridiculous and I think it’s fantastic that they see the value in encouraging local pupils to have the opportunity to take part in these activities. Daisy loved her day and I loved cheering both her and her friends on! All in all, a good day at school and another great day in the office for me! See you again next year where I hope my parenting skills will have improved!